URGENT INFORMATION YOU NEED TO KNOW – NOW! Transitional Facilities are currently being reviewed. MPI are making sure that all these facilities are up to scratch or closed. There has already been a 20% reduction in Transitional Facilities as MPI work to protect New Zealand’s unique biodiversity. Their special focus is on HIGH RISK SITES and they plan to crack down on any Transitional Facility that is not FULLY SECURE AT ALL TIMES. The deadline for this is the 1st SEPTEMBER 2019. As they say, “operating a TF is a privilege and not a right”. So what is FULLY SECURE? Hold the container in a secure fully-fenced and gated area – preferably with an alarm system, security cameras, etc. At HAMPDEN we take security very seriously. With 48 years of experience, 11 prisons, many thousands of commercial fences both big and small behind us we know quite a bit about keeping things in and keeping things out! While we can’t build you a building, we can deliver a secure fully-fenced and gated area with all the bells and whistles. ACT NOW - September is sooner than you think! And one of our team will visit and design a fencing package to suit your specific needs and your site. For further details of what is needed and why, please read through the following information or visit the MPI website. 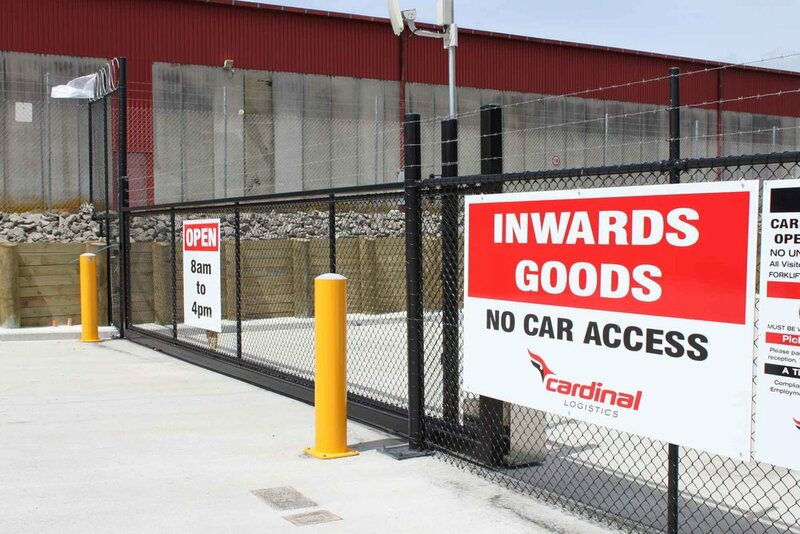 Goods, sea containers and air containers arriving in New Zealand must first go to a facility approved by MPI. Transitional, containment and quarantine facilities have different roles and must meet certain requirements to operate. All sea containers arriving in New Zealand need to be taken to a Transitional Facility and unpacked there. Some higher risk imports – especially plants, animals, and related products – may need to be quarantined or held in a Transitional or Containment Facility. Transitional Facilities hold, inspect, treat, identify, or destroy and dispose of uncleared risk goods imported into New Zealand. They operate under a standard that details the minimum requirements for approval and monitoring transitional facilities functions. Our minister has asked us to take a fresh look at transitional facilities (TFs) and related cargo clearance processes following recent stink bug detections. The move follows two separate detections of single bugs near facilities in Tauranga and Auckland this season. No further bugs have been found following intensive trapping and detector dog surveillance. You will hear about what comes out of the review in later issues of The Border Space. In the meantime, my officers are continuing to ensure TFs are properly managed. Our mantra is that operating a TF is a privilege, not a right. Over the last three years, we have introduced a range of measures that have resulted in a 20 percent reduction in TF numbers. We are continuing to make changes to ensure remaining TFs are up to scratch. Below is a quick update of where we’re at with some recent initiatives. Please bear in mind I am not predetermining the outcome of the review. There may well be changes to these initiatives as a result of the review. Container limit I have mentioned before that we are considering deregistering TFs that don’t receive a sufficient amount of containers each year. We may have to go out for consultation before any changes are made, as the move would affect 25 percent of all TFs. high-risk facilities that don’t meet the new strict requirements. We were planning to make the new security requirements compulsory for all TFs by 1 September. We have since decided it would be unreasonable to ask lower-risk facilities to meet this deadline when things are up in the air about what will happen with the upcoming review. in March, the fines are proposed to be $400 for individuals and $800 for companies for each offence. The aim of these infringements is to send a strong message about the critical nature of compliance. Given this, we do not plan to issue fines when operators identify and report noncompliance to MPI and immediately take preventative actions.